A story about sad endings. A story about happy beginnings. A story to make you realise who is special. When Apple's mother returns after eleven years away, Apple feels whole again. But just like the stormy Christmas Eve when she left, her mother's homecoming is bittersweet. It's only when Apple meets someone more lost than she is that she begins to see things as they really are. 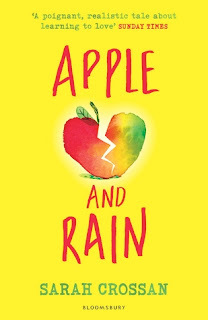 'Apple and Rain,' is the first book I have read by Sarah Crossan, and I was very impressed; I will be definitely reading many more of her books! The novel follows a 13 year old called Apple, who's mother has left her with her grandmother, when she was a toddler. Her grandmother is very strict, and doesn't let Apple watch soaps- she also doesn't like her going to and from school by herself. When Apple's mother finally returns after a number of years, she shocks her with someone else, someone else she didn't even know that existed. Straight away, I almost felt myself melting into the book, and it was really the epitome of heart warming. Teenagers and adults can read it alike, as it has lessons to teach different people, and it touches people in a variety of ways. There are remarkable bonds between certain characters, so strong that it would take an impossibly even more stronger force to break them. I felt myself becoming very attached to Apple, and felt very vexed at all of the people that let her down, and pleased for the special friendships that she was forming. Crossan has managed to let her life branch out it many ways, letting many people relate to the tiny elements. The book had me feeling charmed, tense, and dejected in some places: but in the right way. Normally, I like large novels with long and complicated plots, but pure simplicity really worked for this one: it was also a lovely length for me to read in a small chunk! It didn't blow my mind, but 'Apple and Rain,' warmed my heard touched me in more ways than one- for that I give it a sturdy 4/5. This book sounds like a very nice, touching story. I am glad you enjoyed it and I think I might want to read it myself now.